So you think you want to be an entrepreneur? Perhaps you have an idea, or a problem you want to solve in the world, or you’re just motivated to start something. It’s time to put pen to paper and find out if you have what it takes. Resources evaluation, finding a partner, and audience identification are all important steps at this stage. 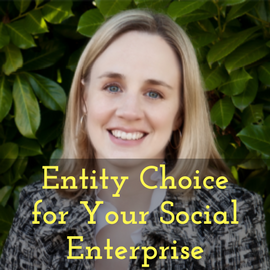 Join Kate Kilberg in the short presentation on non-profits, benefit corporations, and hybrids.